MXL has released some wonderful microphones. They are reasonably priced and do the job. I have used one in my studio for years. The MXL 3000 will make your vocal recordings sound really warm and as clear as any mid priced microphone out there. I was able to record a few sessions with this mic. I was blown away with the clarity. 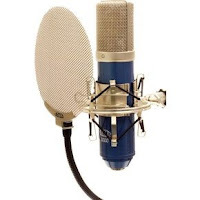 Once I added compression to my vocals, the track sounded just as good as my $1,000 microphone. This mic is also great with instruments. We did a session where we recorded a flute. The MXL 3000 handled the recording exceptionally well with no pops. We made sure to place the mic a decent length away so we did not get a hot recording. It was perfect. My friend told me it also was great with guitar. It comes with a shock mount and a pop filter. The pop filter is a major plus in my book. You will love this microphone. The MXL 3000 sells for around $200 at Guitar Center. Click the link below for exclusive deals.